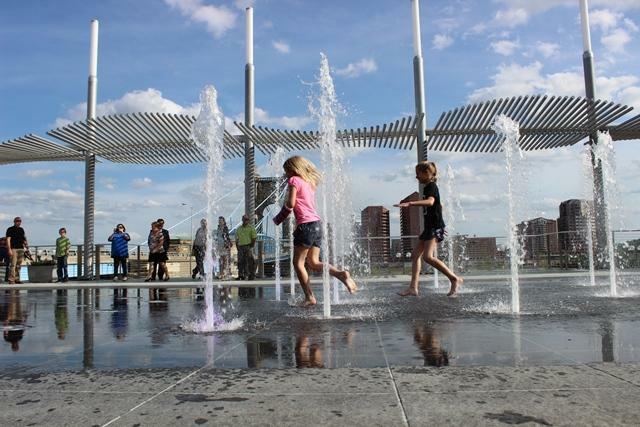 Children play in the fountains at Smale Riverfront Park. The director of Cincinnati's Parks says it needs $4 million annually to take care of deferred maintenance like trail work and repairs. Willie Carden says the city could reach $70 million in deferred maintenance by 2025. He says his number one priority is taking care of park upkeep. Number two is finishing Smale Riverfront Park, which would include building things like a marina. During a city council committee meeting on the subject, Council Member Kevin Flynn expressed concern about starting new projects. "I just worry about taking on additional obligation, or additional potential obligations, before we find the money to meet our current obligations." Council member Yvette Simpson doesn't completely agree. She points out Carden has done a good job of finding people to sponsor or endow multiple park projects. She says something like a marina at Smale would generate revenues and bring more people into the park and their dollars to the Banks. "We need to make the $4 million that Parks needs for maintenance a mega project in our capital budget. We did it with the hundred miles of road repair. We did it with Music Hall. Where we say, every year before we are able to allocate any other dollars in the capital budget, this gets funded." Cincinnati Park Levy Defeated, Now What? Now that Cincinnati voters have rejected a property tax levy to fund city parks, the question becomes how to pay for maintenance and upgrades? A controversial one mill levy for city parks that would have become a permanent part of Cincinnati’s city charter appeared headed for a resounding defeat Tuesday night. The most contentious issue on the ballot this November in Cincinnati centers around something almost everyone agrees on – that the city of Cincinnati has a very good park system. But the proponents of Issue 22 – a charter amendment that would place a permanent one mill tax in the city charter for park improvements – believe they could be even better.